Over the past couple couple weeks, I started experimenting with procedural maths and generative algorithms using the Processing 3 library. My first experimentations led me to create a new Tumblr blog called Generative Primitives where I would post one animated GIF per day. 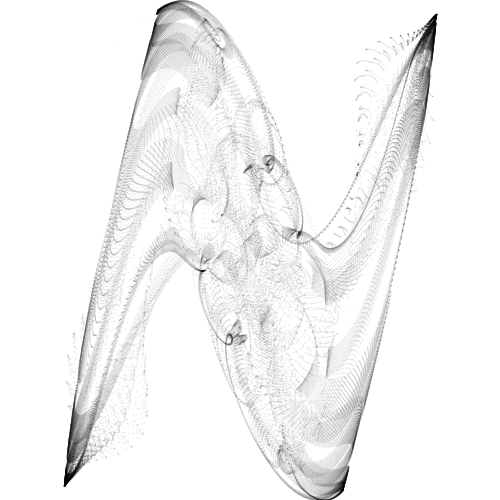 I posted a couple animations while making the code available online for anyone to take a look at on GitHub. After a few posts however, I came across Vincent’s D. Warmerdam’s blog post where he demonstrated how simple trigonometric formulas can draw thousands of points that form a complex, smoke looking like structure. I was inspired by Warmerdam’s post and thought I should experiment with his formula and see where that will lead me to. I ended up making a couple successful animated GIFS using his formula but I wanted to extend the idea further. Since the formula uses just 6 variables (a, b, c, d, e, f) for influence the position of individual points in the generated structure, I could just have a bot do all the generation and I would just sit back, and watch it generate drawings while attributing myself as the creator! Sounds compelling, but don’t know how good would it be if all our art was produced by bots. But regardless, I went ahead and created @OssacipBot on Twitter that generates a structure every half-hour. Shaders are very cool if one has a basic understanding of the difference between the CPU and the GPU. Typical CPU’s are good at processing things that don’t require much of multitasking, but GPU’s are enormously well suited for multitasking. The main reason is because graphics require the GPU to do many things simultaneously, a task that the CPU will most likely not be able to handle well. For example, most modern computer CPU’s have around 2-4 processing cores which gives them a good enough ability to multitask but when it comes to 3D rendering, that small number of cores makes a CPU not well suited for the task. 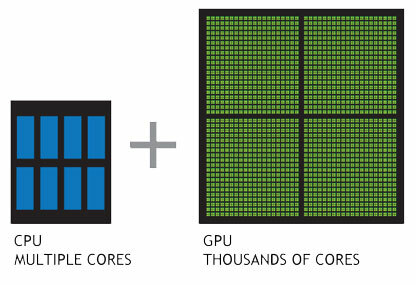 GPU’s on the other hand, have thousands of cores which make them very well suited for graphics. Nvidia’s recently announced GTX1080 GPU card for example, has a total of 2560 processing cores, also known as shader processors. This number is way smaller than the 2-4 cores in a typical processor. It is important to emphasize that shaders are not processors meant for just shading. Although many people are familiar with what a GPU and shaders are, many people think of shaders as programs that paint and shade pixels using the GPU card. In reality however, a shades is a “small program” that can run on thousands of processing cores and do not only graphic related tasks, but even complex math calculations. Now, If come back to my bot, it takes my 15 minutes for it to render my whole 60 frame animation. If for example, that process where to be divided on a GTX1080 GPU card, it in theory would take less than a 1 second to render the same animation! 15 minutes and 1 second, what a difference! So this led me to start experimenting with openFrameworks which is a creative coding C++ library that has an ability to directly talk with the GPU card through a language called OpenGL. I first started creating geometric shapes using so called vertexes. A vertex is essentially a 3D coordinate that you give to the GPU and the you tell it the color, size, style, etc. I ended up making the GPU do all the math which made everything so much faster than in Processing 3. The benefit of OpenGL that openFramworks uses is that all those points are manipulated by the GPU which 1000’s of time more efficient than just using the CPU. This will be a wrap up for the post but it is also just a start. The next step will be to convert my bot into a bot that will take advantage of the GPU allowing it to create more advanced 3D graphics.